You will need to login or register before you can post a message. If you already have an Agriville account login by clicking the login icon on the top right corner of the page. If you are a new user you will need to register. Welcome to the new Agriville! Join in on the Farmer Discussion! 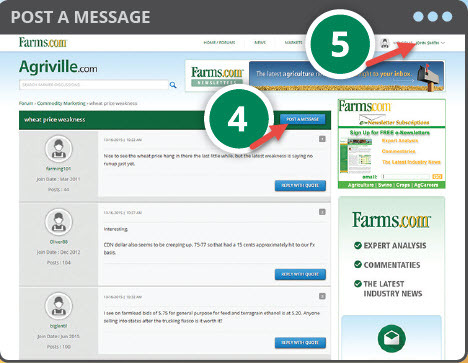 Agriville is one of the largest online farm communities where farmers come to chat. Farmers and agriculture specialists come to Agriville to connect and share information, ideas, and debate on a wide range of topics. If you are involved in agriculture, we encourage you to check out the discussions, ask questions, share ideas, and debate the issues with fellow farmers and ag experts. Mobile friendly – perfect for when you’re chatting on the tractor. Easy to use and navigate. The most recent discussions and most popular posts are featured on the homepage. 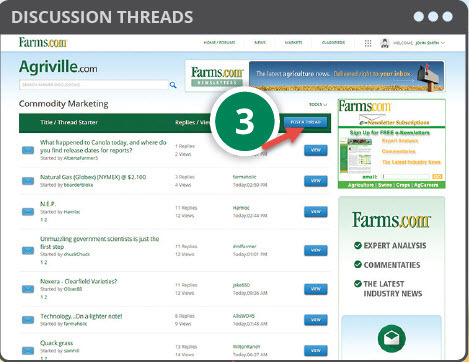 Add images to your discussions to show of your new tractor or your perfect field of wheat. View the history of your discussions so you can track your conversations. Receive email notifications to keep updated on the latest replies. And stay tuned for more updates on the new website! 1. Login or Register to get started. You can use your existing Agriville email and password, or register to create a new account. 2. 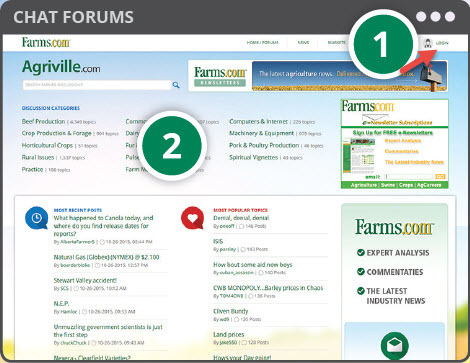 Once you’re logged in, click on a category to see what farmers are chatting about. 3. Browse the discussions or start a new conversation. 4. Have an opinion? Go to Post a Message to join in on the discussion. 5. To keep track of your conversations, click the user profile icon to view a history of all your discussions.